The global context of English . . . makes the traditional categories [= American English and British English] more problematic and the choices more complex than they were previously perceived to be. American English may be the most prominent source of emerging global English, and yet it will be American English derancinated and adapted in a utilitarian way to the needs of speakers whose geography and culture are quite different. To the extent that Americans think about the global use of English at all, it is often as a possession that is lent on sufferance to foreigners, who often fail to get it right. Such a parochial attitude will change as more Americans become involved in the global economy and as they become more familiar with the high quality of literature being produced in post colonial settings. Many earlier attacks on American English were prompted by the slang, colloquialisms, and linguistic novelties of popular fiction and journalism, just as recent criticism has been directed at jargon in the speech and writings of American government officials, journalists, and social scientists. Along with the good use of English there is always much that is indifferent or frankly bad, but the language of a whole country should not be judged by its least graceful examples. Generalizations about the use of English throughout a region or a culture are more likely to mislead than to inform, and questions that lead to such generalizations are among the least helpful to ask. 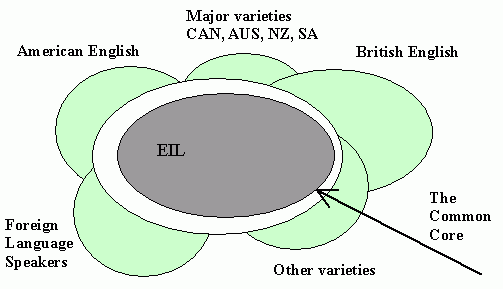 In the United States, as in Britain, India, Ghana, and the Philippines, in Australia and Jamaica, one can find plentiful samples of English that deserve a low estimate, but one will find a language that has adapted to the local conditions, usually without looking over its shoulder to the standards of a far-away country, and in so adapting has become the rich medium for writers and speakers of great talent and some of genius. ・ Quirk, Randolph, Sidney Greenbaum, Geoffrey Leech, and Jan Svartvik. A Grammar of Contemporary English. London: Longman, 1972. ・ Modiano, Marko. "International English in the Global Village." English Today 15.2 (1999): 22--28. ・ Modiano, Marko. 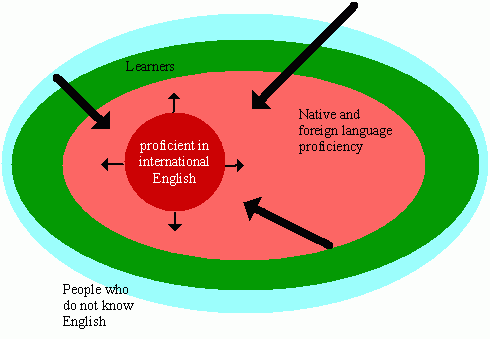 "Standard English(es) and Educational Practices for the World's Lingua Franca." English Today 15.4 (1999): 3--13. ・ Martinet, André. "Quelle sorte d'anglais pour les plurilingues à venir?" International Journal of the Sociology of Language 109 (1994): 121--27. ・ Barber, Charles. Linguistic Change in Present-Day English. Alabama: U of Alabama P, 1964. 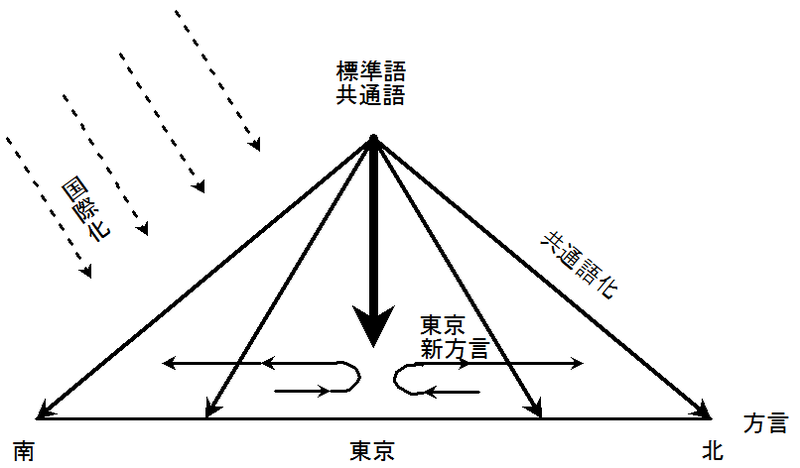 (e) different starting/ending points: 両変種で通時変化の開始時期あるいは終了時期が異なっている場合．およそ同じタイミングであれば，similar staring/ending points と呼ばれる. ・ Mair, Christian. "Three Changing Patterns of Verb Complementation in Late Modern English: A Real-Time Study Based on Matching Text Corpora." English Language and Linguistics 6 (2002): 105--31.